Most people put their teeth and mouth through a lot of wear and tear each day. On a daily basis, the teeth are used to bite and chew and are almost constantly exposed to foods and beverages that have potential to stain and discolor the teeth. With all that exposure and work that the teeth are put through, it can be very difficult to keep them looking their best. For patients that have severe aesthetic flaws, porcelain veneers can help them achieve a smile makeover by hiding blemishes. However, patients who have less severe imperfections or fewer teeth to treat may want to consider a more affordable and less invasive cosmetic treatment. For these patients, Dr. Amber James offers cosmetic dental bonding. For our New York patients, cosmetic dental bonding has helped countless patients address unwanted blemishes to create a more attractive smile. Chips and cracks: Dental bonding material can be molded to the teeth to fill in cracks and replace tooth enamel that has chipped off due to damage or injury. Tooth discoloration: Whether an entire tooth is discolored or if a patch of tooth is stained, dental bonding material can be matched to the color of the adjacent teeth and then applied over a discolored tooth to create a bright, white smile. Gaps between teeth: Dental bonding material is commonly used to fill in gaps between the teeth to give patients a smile that looks symmetrical and attractive. Misshapen or poorly sized teeth: Just as bonding material can be used to fill in the spaces between teeth, it can also be used to lengthen a tooth or just improve the overall shape of a tooth so that it blends in more naturally with the surrounding teeth. Exposed tooth roots: If the top of the tooth by the gum line has become exposed (as is commonly the case with gum recession), dental bonding material can be applied to the top portion of the tooth to fill in gaps between the teeth and gums. Not only does this improve the aesthetics of the smile, but it also offers some protection to the tooth and helps to block out harmful bacteria. 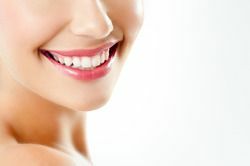 It is common for the teeth to develop cosmetic blemishes, but, fortunately, there are many cosmetic treatment options that allow patients to address these imperfections and enhance the beauty of the smile. If you are looking to improve the appearance of your teeth, schedule an appointment with Dr. Amber Jones at your earliest convenience to learn more about our wide range of cosmetic dental treatments. We look forward to hearing from you!